Throughout the rugby season the main feature of HarpinOnRugby.net is our writeup of what we call the 'match of the weekend', which generally involves Leinster, Ireland or the Lions and is published on Monday. July, however, rarely gives us the chance to do this, so we either take some time off or look to Super Rugby for a chance to 'keep our hand in' before the preseason matches begin. My original plan for this Super Rugby semifinal was to do a straightforward writeup on the 80 minutes but as I watched on Saturday morning I realised I couldn't hide my Leinster goggles. I wasn't merely watching as a neutral - I was more about keeping an eye out for Leinster's new signing James Lowe to see how I reckon he'll fit in for the upcoming season. So be warned - I'm not writing this article to pretend I'm some kind of expert on Super Rugby as if watch it all through the campaign - what with the busy European schedule including a Lions tour at the end my opportunities to watch the 2017 campaign have been limited. These are opinions from afar of the match, the other semifinal, the competition in general, and most importantly for me anyway, a player bound for the RDS - so why don't we start there. Don't read too much into the headline, please - it's merely a pun on his name and in no way demonstrates my feelings on his move here; it's more ironic than anything else - I wish him all the best. However if you watched a basic highlight reel of this semifinal against the Crusaders, you'd be forgiven for thinking it wasn't an ideal night at the office for him. Both the second and fourth tries for the home side came after errors he made, one directly as he had a clearance kick poached after he released the ball, the other indirectly as he dropped a catch he'd be expected to take and as a result the Crusaders went down the other end and eventually dotted down. But as often is the case with highlight reels, you don't get the full story of what happened over the 80 minutes. In fact, you don't always get the story of what happened in a given moment - both the errors I mention above came from Lowe trying to make the most out of tricky situations which had developed moments earlier. In actual fact, based on the evidence of this match as well as other previous 'scouting mission' watching of Chiefs matches when I got the chance, he seems to be a player who could slot in very well at Leinster. He's a big unit for a winger and definitely not one to hang about waiting for the ball to reach him. He'll get stuck in and clear out when required. He seems to know when to use his pace up the touchline and when to cut in and recycle. Joe Schmidt might be tempted to check for any Irish ancestry as a winger like the former Maori All Black would fit right into his setup. The attribute Kiwi commentators mentioned the most though was his booming left boot. We did see it a couple of times in this match, but he also seems to know how to kick more deftly. The Chiefs had three decent try-scoring chances in the first half and he was involved in all of them. Just before the break he showed strong pace up the wing and he proved hard to stop in the 22 providing the kind of front foot ball the likes of Johnny Sexton craves, while the two earlier chances resulted from a little grubber that really should have been finished by Nanai Williams followed by a garryowen that gave the Crusaders defence some rare problems. If I had to find a fault in this performance it was in his broken play running. That might seem harsh as he was credited with 81 metres on the night but that was from 18 carries and for the most part he was running into dead ends. To be fair to him, however, he was up against an extremely well organised defence which proved to be the winning of the contest. So overall a positive report for Lowe and I really do think he can do a job for us both in the Pro Whatever and in Europe. Now to harp more on the actual match itself. The Chiefs got a try in the 78th minute from Brodie Retallick but the match was well over at that point. To get a sense of the dominance of the Crusaders defence, consider the score was 27-6 just before the All Black lock touched down. Now consider that the home side had just 33% possession and 30% territory throughout, and had 185 tackles to make as opposed to the visitors' 66. And it's not as though the opposition were slouches. The Crusaders may have won the most Super Rugby titles but the Chiefs won back to back more recently and with names like Cruden, Retallick, Cane, Leinart-Brown, Messam, Mackenzie and yes, Lowe among others, it took a fair amount of consistent line speed and accurate scrambling to keep them out that that's exactly what they did. It was a long, long way from the kind of rugby you'd expect from an All Black side that's for sure, but for this particular day it was certainly effective. Matt Todd stood out the most for me. But all the defence in the world won't win the day if you're not putting points on the board and if anything the Crusaders were even more efficient with the ball. The first try was started and finished by scrum half Bryn Hall - in between there was a superb shimmy around one player and fend off another from Crotty before he shipped it to Israel Dagg who powered through before teeing up his number 9. It was the defence that was responsible for tries two, three and four...sure, they had to be finished by Dagg and Tamanivalu  respectively but in each case the attacks began with the Chiefs having the ball on the halfway line or beyond. Basically it was the kind of display I was hoping Leinster would be able to show in the Pro12 playoffs back in May. Yes, it still hurts. Later on Saturday we had the Lions of Johannesburg facing the Hurricanes of Wellington. The South African franchise were the only one with a regular season record that came close to that of all of the Kiwi sides, although they were yet to face one. With half an hour gone it looked as though an all-New Zealand final was guaramteed as the 'Canes shot out to a 3-22 lead but you rule out a home team on the Highveld at your peril. To be fair to the Lions, while the visitors were bound to tired because of the travelling and altitude, the scores still had to be found and the six tries they found in their comeback were all well earned. From my lofty perch of merely having seen both semifinals, the destination of the trophy seems to be all about patience. If the Crusaders can match their defensive stubbornness from last Saturday, they will be just as tough to break down. 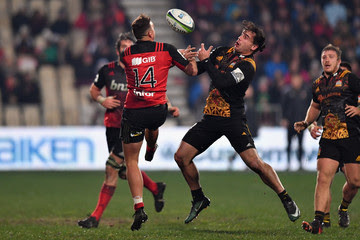 However, the Lions' superior season record gives them the home advantage and I don't know if the Crusaders can afford to let their hosts have the ball for two thirds of the contest this time, especially in the closing stages as the lungs start gasping. Whatever way you look at it, it looks set to be a cracker and I can't. Doesn't hurt that I don't have to be up and alert at 8:30am either! Again I have to plead ignorance about the season as a whole, but I must say it was disappointing to see so many empty seats at both semifinals, especially the one in Christchurch as it involved to Kiwi sides. This is meant to be the southern hemisphere's answer to the Rugby Champions Cup and both our semifinals were pretty much sold out. Maybe they could consider small stadia for these matches but that's something of a Catch 22 because if they're forced out of the test arenas then you can't really justify the prefix 'Super' for the competition can you? I understand there were a lot of objections to the format over the past couple of seasons, maybe that will help though I wouldn't be too sure. Anyway that's enough of a ramble for this week. Even though there are no Leinster-bound players involved in the final [Scott Fardy's Brumbies perished in the quarters] we'll look to do something similar for the final and after that we'll be all about the Women's Rugby World Cup.